The Baltimore Bays have added another goalkeeper to their 1968 roster. He is Lincoln Phillips, a 26-year old Trinidadian who is as much at ease on a basketball court as he is on a soccer pitch. DEREK TOMKINSON, the Bays' Caribbean scout, reports that last Sunday the national team of Trinidad bested the Haitian national team, 1-0. Phillips stopped four shots that would have been certain goals and what makes the report even better as far as the Bays are concerned—Guy St. Vil was the shooter. PHILLIPS WAS a career man in the Trinidad Army before being contracted by the Bays. 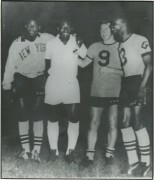 He was Captain and coach of the Army's soccer team as well as being on the starting five on the Army basketball team, the top hardcourt squad in all of Trinidad. "Lincoln thinks enough of his chances to be an outstanding goal keeper in the North American Soccer League to give up his Army career, and we think enough of his ability to persuade him to do so," says Bays general Manager, Clive Toye.